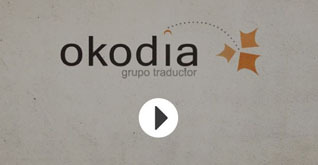 Okodia – Translation Group is a translation agency founded in 2011 which provides technical translation and revision services. To strengthen their position as the main translation service provider among their clients. To carry out multilingual projects in any business area. To improve the internationalization process of their clients. To have the best network of professional native-speaking translators. To analyze customer needs and develop personalized solutions. In summary, the organization’s aim is to continually improve as a company. For this reason, the Management makes a commitment to implement and maintain a Quality Management System based on the ISO 9001:2015 and ISO 17100 standards to ensure their clients’ satisfaction, fulfilling all the requirements and the commitment to continually improve the efficiency of their Quality Management System. As a result of this decision and aspiration, the Management is committed to providing the material and human resources required to achieve the above-mentioned objectives, with the conviction that the cost involved is a worthwhile investment. Likewise, in order to ensure that these principles are adhered to, we believe that motivating and training the staff as part of their professional growth and promoting teamwork, granting them the relevant responsibilities and authorities, are fundamental. This Quality Policy will be disseminated to all the staff and partners of Okodia – Translation Group through notifications of it or training actions to ensure that it is fully understood.